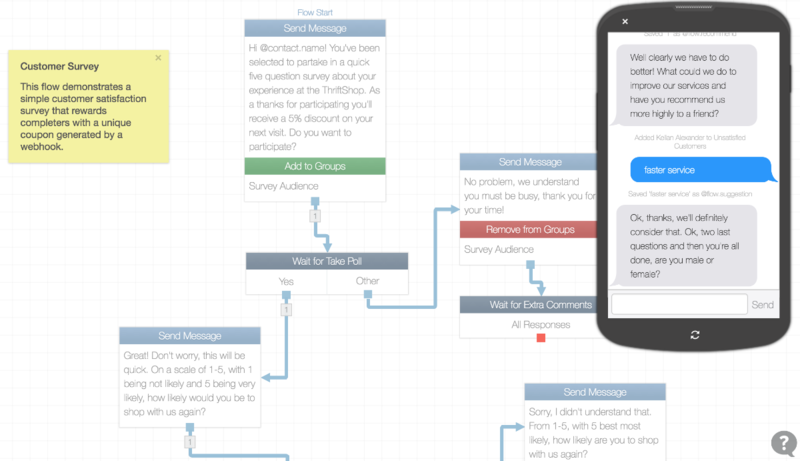 If you're using TextIt, you're likely interested in analyzing the results of each interaction your contacts have with your messaging bot. You probably also want to streamline the process of viewing and analyzing them. You can do so by sending the results of each flow run to a Google Sheet as your contacts finish them. There, you can visualize your data as it's being updated and even build a custom dashboard. 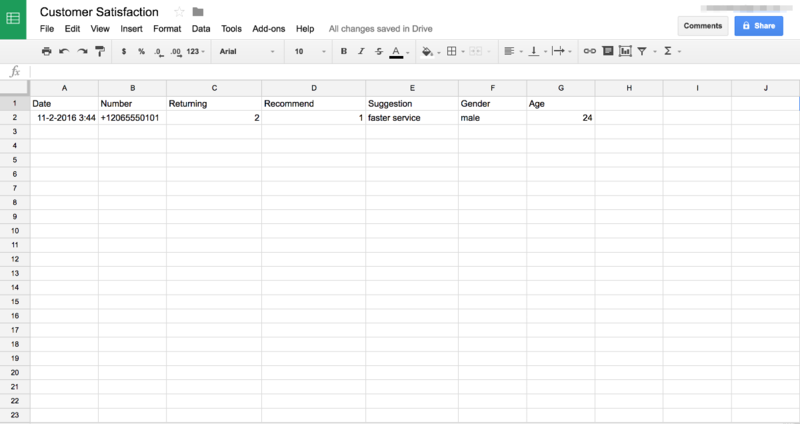 Our goal: To send flow responses to a Google Sheet. This messages in this flow run will be sent to a Google Sheet. A new row will be created for each run. First, we’ll create a new spreadsheet and set up the rows that will hold our data. To make these columns easier to interact with, we’re going to make use of Named Ranges. This allows us to give each column a name that we can reference in our script. To name a range, double-click the column, then select 'Define named range...'. Give it a one-word name. It's vital that all rows are selected, e.g. 'Sheet1!B:B'. Go ahead and name all 7 of your new columns. Now we'll start scripting. From the Tools menu, select Script Editor. Give your script a name. 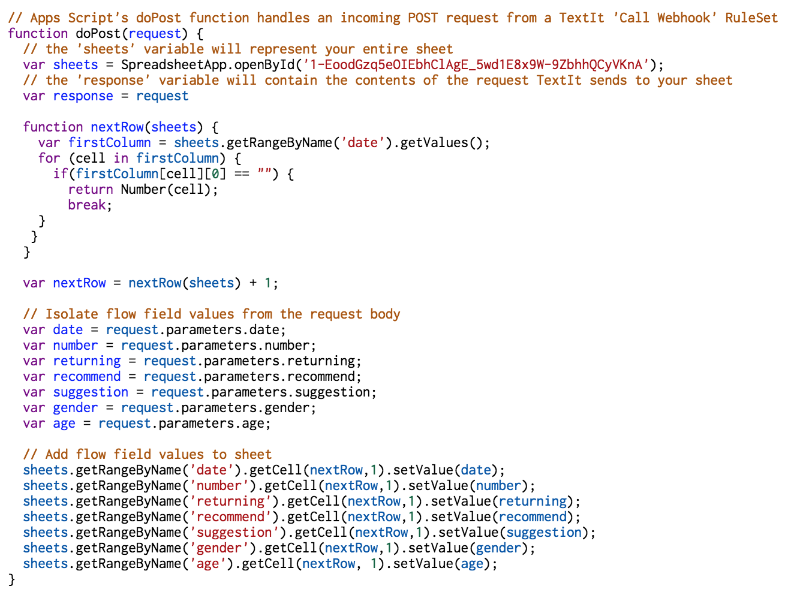 Line 1: we create a doPost() function so that our script can receive flow results via POST requests. These POST requests will be made when the active contact reaches a Call Webhook RuleSet. This function, unique to Apps Script web apps, will process any new POST request from our flow once we’ve deployed our script as a web app. Line 2: we're gaining access to our spreadsheet file. 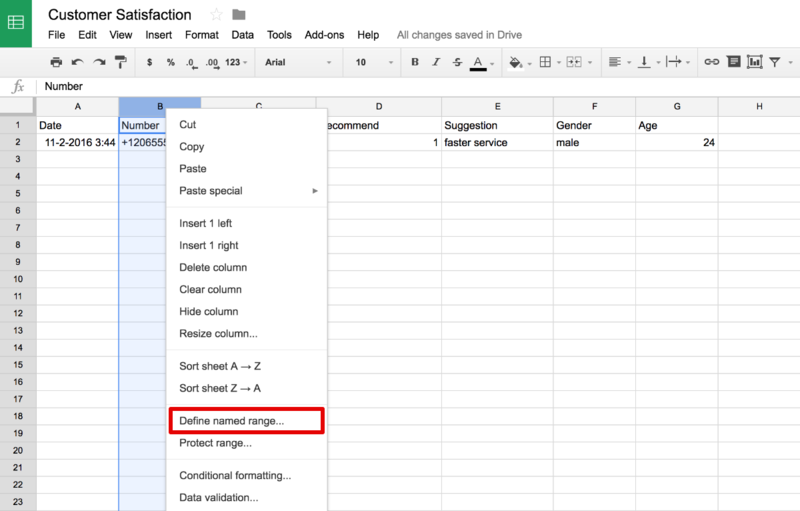 Google Apps Script differentiates between a spreadsheet and a sheet (a spreadsheet is a file that may have one or more sheets–or worksheets or tabs). We can gain access to the entire sheet by referencing its ID (the long string of characters in the spreadsheet’s URL after '/d/'). Replace the placeholder in the code with your spreadsheet ID. Line 3: the request object will contain the entire payload of the incoming POST request. We're assigning it to a variable in order to conveniently access its parameters. 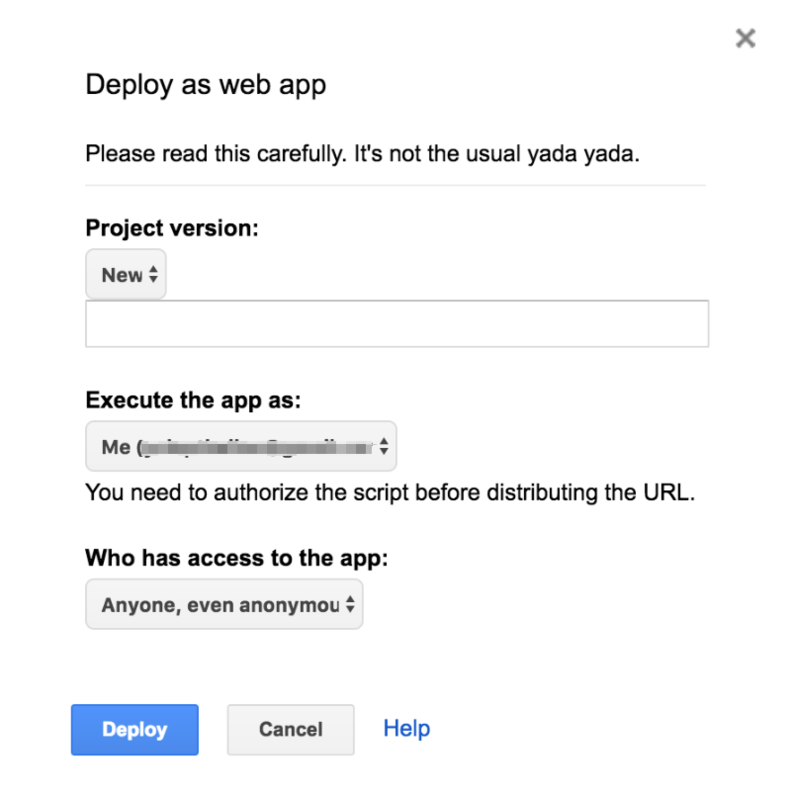 Click Deploy, then copy the address of the Current web app URL to your clipboard. 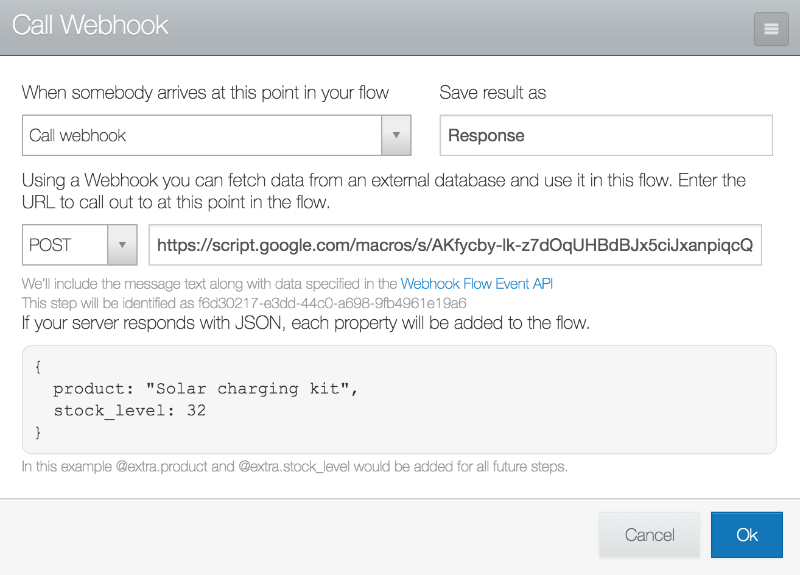 You’ll need that for your webhook. Congradulations, you've just published a web app! Before you click Ok, make sure to add a query string to the end of the URL to include the flow variables that represent the responses your flow has collected. Not familiar with flow variables? Learn about them here. The query string represents everything from the '?' to the end of the URL. It allows you to create parameters to be sent to your web app. We're simply adding flow fields to the URL so that TextIt knows to send them to our web app and the Google Sheet knows to add them to its columns. The names you give these values should be one word and describe them accurately as you'll be referencing them in your script. In this case, date in request.parameters.date and .getCell(nextRow, 1).setValue(date) should be changed to the name you gave your date flow field (if other than @flow.date), and 'date' in sheets.getRangeByName('date') should be changed to the name you gave your date column in your Google Sheet (if other than 'date'). Questions? Comments? Let us know. We love hearing from you.